Cakewalk is Stepan Meidell (The Sweetest Thrill), Øystein Skar (Highasakite, Sacred Harp) and Ivar Loe Bjørnstad (Hedvig Mollestad Trio). The music on their critically acclaimed debut album “Wired” from 2012 was described by Mojo Magazine as “hypnotic angular improv grooves, hammering home strobing images of Konono No 1 tearing it up with greasy Benzedrine hoodlums in a No Wave New York Loft.» – which pretty much sums it up. Their second album «Transfixed» takes them in a new direction. The short, concise and sometimes punk-ish slap in the face is now replaced by a longer, darker and more massive album. In reviews of their debut album references to kraut rock, Bowie/Eno´s Berlin, early Sonic Youth and Explosions in the Sky where drawn. On the studio sessions for Transfixed the trio also invited with them Espen Sommer Eide aka Phonophani (and a member of Alog) as a guest. He brought his Buchla synthesizer and play an important role on the zen-like track “Dive”. The amount of top-class, boundary-defying music coming out of Norway these days is quite simply amazing. 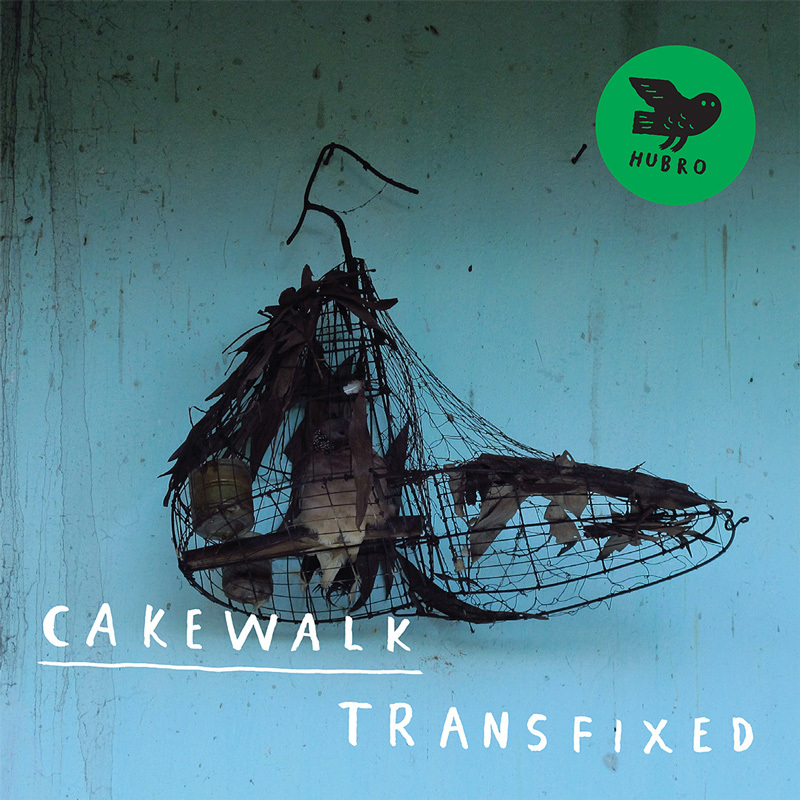 Cakewalk´s second album, Transfixed (Hubro) is well chosen, formed as it is fron insistently hypnotic riffs, strafed by ragged guitar and angular synths. Powerful and fiery, it frequently build into wrenching crecendos whose tumultuous waves of release wash over the listener with an ecstatic fervour. Bergen-based Cakewalk release their second album ‘Transfixed’, two years on from their well- received and critically approved debut album ‘Wired’. The band features Stepan Meidellm, Oystein Skar and Ivar Loe Bjornstad , all of whom play in various other bands based mainly in Norway including Hedvig Mollestad Trio, Sacred Harp and the Sweetest Thrill, so the fact that they managed to get some time between these bands in itself is quite an achievement. They play drone-like futuristic stoner rock, and the initial impact of some of the songs knocks you back and pleads to every one of your senses. Following on from their short and extremely sharp debut album, 2010´s Wired, comes a second album from Cakewalk on which the Norwegian trio manage to blast out a more expansice take on their krautrock-influenced noise rock while maintaining their histrionic levels of sound overload. Hubro is a Norwegian indie label dedicated to promoting that country´s jazz and improvised music scene. Its latest release, Transfixed by Cakewalk, is a churning, visceral thriller. Antecedents for the project might include Berlin-era Bowie, the noiser bits of Mercury Rev and Sonic Youth´s early output. Roiling, unremitting guitar-heavy opener Ghosts echoes Placebo´s Pure Morning. Clocking in at a bruising eight minutes, it´s a bit like taking a long, lacerating walk through a brooding flat, fog-enhanced landscape. Bells, by contrast, has a real spring in its motorik step and features blissed-out, chirning synth work from Øystein Skar. This is a second outing by the noise-loving experimental improvising guitar/synth/drums trio from Norway following on from 2012’s edgy debut Wired. With a guest in Espen Sommer Eide of the band Alog popping up on penultimate track ‘Dive’ it’s a grimy avant rock-infused eerie meditation full of a certain indie angst(…)If you’re looking come January for an antidote to an overly festive Christmas period then step forward Cakewalk to supply the necessary grim reality. All things Kraut, prog and analogue electro have now become such officially sanctioned signifiers of middlebrow good taste, they can seem lazu and predictable. But Norwegian trio Cakewalk still interrogate these elements with invention and bite, blurring the lines between drone rock and dub, improvised jamming and mehanised noise. Billed as a more punky and concise affair than their 2012 debut, this second album is more abrasive. The clanking instrumental juggernauts “Ghosts” and “Dunes” sound like steam-powered robots trying to play jazz, but the stand-out is “Swarm”, a seven-minute psych-out of crackling, heavily pock-marked Krautronica brightened by unexpected blooms of ambient beauty. What´s in a name? The Beatle, as everyone will now tell you, was a terrible name for a band, and yet they still made it. Well no. “The Beatles” at least told you something about the group in that plosive “Beat” and the shiny black allure of that pun. But Cakewalk? Cakewalk suggest a mid-´90s major label powerpop quartet from Austin, Texas and not the fervid thicket of Congotronic improv noise that Stephan Meidell, Øystein Skar adn Ivar Loe Bjørnstad made on their knockout 2012 debut, Wired. If anything, Transfixed is even less suited to their name, moving through a dark spectrum of electric euphoria, from post-rock storm assaults to strobing kosmische soundscapes and epic horrorcore riffs, all played with the cool intuition and hipster stealth of the best jazz trios. Cakewalk are keeping the improvisational flame alive on Transfixed. They hone and sculpt a song until they’re mini modernist works of art. The other way to describe Transfixed, is a cinematic Magnus Opus, where Cakewalk continue to push musical boundaries to their limit and beyond. Nach Schlagzeuger Ivar Loe Bjørnstad würde sich jede Doom-Metal-Band die Finger lecken. Unbeirrbar stoisch schlägt er seine Patterns durch auf Teufel komm raus. Darüber sind Synthesizermann Øystein Skar und Gitarrist Stephan Meidell auch nicht gerade Fantasiebolzen, vielmehr jonglieren sie mit neckish auf der Stelle tretenden Klangflächen. Dennoch oder gerade deswegen ergibt das eine ungemein druckvoll und suggestive Music, die vor allem deshalb in die Jazzecke gehört, well sie aus dem Moment entsteht. Laut muss man das hören, am besten noch lauter. Das ist Musik für den Headbanger in uns allen, minimaistisch, telepatisch und intensiv. Dunkel und doch optimistisch klingt das, wie aus einem Guss unde volkommen logisch. Nach wie vor schwere Kost, was uns die Norweger da vorsetzen. Im Vergleich zum Vorgängeralbum Wired geht das Trio jetzt noch mehr in die Tiefe der Improvisation und der wuseligen Jam-Sessions, die bei den neuen sechs Stücken allerdings auf maximal 8 Minuten Spielzeit eingedampft wurden. Was hier zutage tritt, ist nach Ansicht der Band eine Art musikalisches Freistilringen zwischen Rock, Noise, Jazz und zeitgenössischer Musik (was immer man darunter verstehen mag). Hat man erst einmal den wuchtigen Einstieg mit dem Titel „Ghosts” hinter sich gebracht, kann man fast zur Entspannung übergehen und einem eigenwillig interpretierten Glockengeläut lauschen, das in diesem Rahmen fast schon als harmonisch zu bezeichnen ist. Der folgende Titeltrack wiederum erweist sich als einigermaßen sperrig und man hat Mühe, den Nordmännern bei ihrer Reise in höllische Abgründe zu folgen. Dem apokalyptischen Trip folgt sogleich ein weiterer, der allerdings etwas weniger wuchtig, dafür aber wesentlich rhythmischer ausfällt. Wie sich mit einem Modular-Synthesizer ein Zen-Ambiente aufbauen lässt, beweist der Titel „Dive”, bei dem Espen Sommer Eide einen entsprechenden Gastpart übernimmt. Den Abgang markiert „Dunes”, eine langsame, hypnotische Hymne im Halbdunkel zwischen Düsternis und Sonnenaufgang. „Transfixed” ist ein spannendes Album, das allerdings erarbeitet bzw. erhört werden will. Ein Jahr nach dem bereits sehr starken Debüt »Wired« setzen Cakewalk einen drauf und bekräftigen ihren Status als eine der kraftvollsten und, ja, besten Bands im Bereich (Free-)Jazz-meets-(Kraut-)Rock beim mittlerweile hochverdienten norwegischen Label Hubro. Alle lobenden Worte, welche der Kollege über »Wired« ausschüttete, können direkt auf »TRANSFIXED« übertragen werden — nicht nur ist die Platte ein Drittel länger, sie ist auch mindestens ebenso viel besser. Det krautrock- og elektronika-inspirerte bryter ned det industrielle og progressive, og gjør musikken mer fordøyelig, mer tilgjengelig. Cakewalk kombinerer sjangre som ikke nødvendigvis burde ha kommet overens, men som likevel på sitt vis gjør det. De lager musikk som både vil og tør være helt egen. The majority of the work on Transfixed is improvised. But you would never know but how well the notes come together so smoothly. And that’s when you know you’ve heard a work of beauty. When the origin is never discernible. Cakewalk are a growing, working trio that should emerge as one of the most important over the next few years. Transfixed is the perfect document of that philosophy. Highly Recommended. Dette er groovete, tøff og original musikk – unnfanga der og da i studio i Bergen. De tre stoler utvilsomt hemningsløst på hverandre og veit at gir de musikken og ideene tid, så skjer det masse underveis. De har jamma sammen i timesvis og kommet opp med riff, strukturer og melodier som de er helt aleine om. Noen ganger er det tungt og heftig, noen ganger er det meditativt og søkende, men hele tida er det spennende, uforutsigbart og annerledes. irst the good news: Cakewalk’s stunning Transfixed. On their follow-up to 2012’s debut album Wired, Stephan Meidell (guitars, bass, tape machine), Øystein Skar (synthesizers), and Ivar Loe Bjørnstad (drums) serve up a molotov cocktail of jagged grooves laid down in their Bergen studio. Rooted in experimentation and hours of jamming, the band’s sound, according to Meidell’s liner notes, “ranges freely beyond the shadows of rock, noise, jazz, and contemporary music.” That it does, but a more interesting comment reads: “You’ll definitely want to compare us to someone else, but chances are, we’ve never listened to them. Musicians in general are often confronted with references that are flattering, but completely false.” With that in mind, we’ll resist the urge to draw connections from Cakewalk to other artists and simply make note of the group’s propensity for fashioning heavy, lumbering grooves that seethe and burn. Den mest utfordrende plata som jeg i tillegg har vugget hodet til må være Cakewalk sitt album Transfixed. Drivende rytmer, utforskende gitarlyder og et intenst fokus på suggesjon og improvisasjon. Cakewalk mestret sitt eget uttrykk og klarte å få det i sin pureste form ned på en innspilling. Cakewalk, aus Norwegen, ist ein Gitarre-Bass-Drums-Trio unter Einbezug von diversen Synthesizern. Ist der achtminütige Opener „Ghost“ noch ein lava-artig fließender, wuchtig-majästätischer Sound, wird mit „Bells“ ein Postrock-Track mit dissonantem Glockenspiel, federnden Drums und flächigen Synthesizer-Sounds nachgeschoben. Cakewalk sind gleichermaßen geschult an Kraut-, Jazz- wie Noise-Rock und ihre sechs mittellangen Instrumentals entstanden in stunden – langen Studio-Jams. Verwechseltes bloß nicht mit einfallslos. Ich mag es sehr, wenn Bands es schaffen, eine prägnante (Rhythmus-)Idee einige Minuten lang durchzuhalten und nicht in die oft seelenlos mäandernde Prog-Falle zu tapsen und einen nicht ausdefinierten Songteil überhastet an den nächsten kleben. Auf ihrem zweiten Album erschaffen die Norweger instrumentale, schwer zu greifende Psychedelic- und Krautrock- Momente. Höhepunkt: das Kernstück „Transfixed“. Es offenbart mit seinen im Hintergrund schwelenden, verdrehten Quietschsounds und dem durchgehaltenen Basslauf eine gewisse Nähe zum monumentalen „National anthem“ von RADIOHEAD.